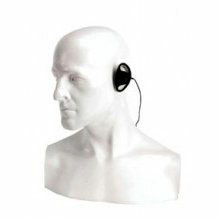 A ‘D’ shaped soft rubber-feel earpiece which fits over your ear. The earpiece is designed to connect into the HT series radio, via the locking accessory connector. (Note: before this accessory can be used, it is necessary for the dealer to enable the listen-only feature in the radio’s programming software). This accessory is designed for light to medium duty applications, so to ensure maximum life span it should be personally allocated to users.